If there's one figure range that's impressed me in the last few years it's Megahouse's Excellent Model range. 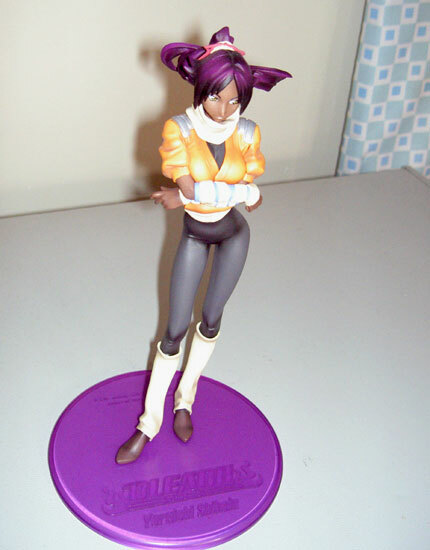 These large scale plastic figures have used several anime series for inspiration, including Bleach and Saint Saiya, but unusually the figures have all been of an exceptionally high quality. 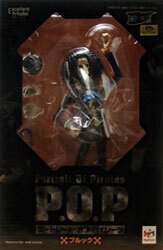 The best of the whole line have, without a doubt, been the One Piece Portrait of Pirates figures. Whilst the Bleach Excellent Model range only contains six figures, the Portrait of Pirates range has been so successful that not only do new figures regularly get produced, but several of the older figures have been re-issued. However, the figures I am reviewing today aren't the re-issued ones, they're brand spanking new! mask and pigeon for Lucchi and teacup, swordstick. tone dial and top hat for Brooke), and require some very basic assembly. Once assembled the figures stand at around 25cm (10") tall. When I saw pictures of these figures online I must admit that I thought they would be a bit dull. 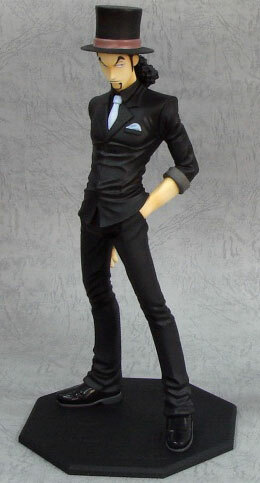 Both figures are dressed in suits and the colour of the clothing on both is predominantly black, the Lucchi figure in particular has barely any other colours on it. However, when you see them in real life they are anything but. The figures are nigh-on perfect realisations of both Brooke and Lucchi, from the outfits right down to the pose. The sculpting is awesome, bringing a fantastic level of detail that really brings the characters to life. As with all of the Excellent Model figures it is clear that a lot of care and attention to detail has gone into the design and creation, and they just get better the more you look at them. Small details, such as Brooke's torn sleeve revealing his skeletal arm or Lucchi's polished shoes, really set them apart and it's impressive how well made they are. Often with plastic figures you get bits that don't quite connect cleanly, such as feet that don't sit flush to the base, or accessories that don't connect easily. These figures don't have these issues, and it's a testament to their manufacture that many of the accessories rest surprisingly stably on the figure instead of connecting to them. real issue I had is with the top of Brooke's head, which can be removed in order to put the tone dial accessory inside. Whilst this is quite cool it does leave a very noticeable join line around the top of Brooke's afro, which could have been disguised far better. At the end of the day though it's a minor quibble, as these latest Portrait of Pirates are superb. It's amazing how much character the sculptors have managed to get into what could have been a pair of boring, monochrome figures, and the level of detail is great. The figures are 1/8 scale like the others in the Excellent Model series and feel solid and sturdy despite Brooke's lack of midriff (he is a skeleton after all). Each character looks exactly like their anime and manga counterparts, and the only shame is that they're so hard to get hold of. If you can find them these are must buy figures, even if you're not familiar with the characters you can't deny that they're damn cool. A plastic base with the character name (in English) and a relevant emblem embossed on it is included with each figure. The base has pegs on it for the figure to attach to and no glue is required. Also included with each figure are a number of accessories that can be attached in various combinations - Lucchi has a hat, mask and his tie-wearing pigeon Hattori, whilst Brooke comes with a teacup, hat, tone dial and a walking stick with a swappable swordstick blade. Brooke's jaw is also moveable and the top of his head can be removed and the tone dial stored inside, which is a nice touch too.